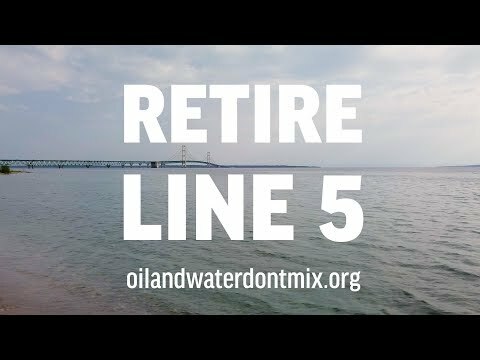 When you give $150 or more to this campaign, you can become an Oil & Water Don't Mix GREAT LAKES WATER PROTECTOR! You'll get benefits like water protector updates, a Shut Down Line 5 sticker, and recognition at OWDM events for your stellar support. Find out more here. A 65-year-old oil pipeline known as Line 5 lies exposed and dented at the bottom of the Straits of Mackinac. It carries millions of gallons of oil each day through the heart of the Great Lakes, the largest source of surface freshwater in the world. An oil spill here would be catastrophic for our economy, health, drinking water, fisheries, and way of life. Help us take legal action to protect these waters. This pipeline is owned by Enbridge, the same Canadian company responsible for the Line 6b pipeline spill in Kalamazoo, Michigan in 2010 - the largest inland oil spill in U.S. history. That was a wake-up call about the risks posed by the oil pipelines crisscrossing our state. As public trust stewards of the Great Lakes and holders of the easement with Enbridge, Michigan officials have the legal authority and duty to act on Line 5. It has become clear that the governor and attorney general are not going to enforce the law, do their jobs, and protect the Great Lakes and our homes from the risky pipelines. So we citizens are now taking legal action to protect the Great Lakes from this pipeline, and we need your help. • Are being drilled into unstable lakebed that can shift. Also, Enbridge is operating the 65-year-old pipeline beyond its expected life and should have been required by the state to prove it could operate safely before any permits were issued. Enbridge has been unlawfully allowed by the state to expand Line 5’s operations through piecemeal approval of permits under the guise of “maintenance” in violation of the state’s Great Lakes Submerged Lands Act. What the Canadian transport giant is really doing is establishing a whole new pipeline design in the heart of the Great Lakes without sufficient environmental reviews. The only way to protect the Great Lakes from an oil spill is to decommission Line 5 in the Straits, and the state's own analysis found this is a viable alternative. Instead, the state is allowing Enbridge to put band-aids on this rickety pipeline to allow this Canadian oil shortcut to continue. This is our first legal action, and the first necessary step in getting Michigan to change course, do what is right, and shut down Line 5. Funding is needed for attorney fees to contest the MDEQ's decision to approve the anchors without doing a full review of the pipeline to determine whether it belongs in the Great Lakes, and for expert witness fees if we need to appeal. Enbridge has virtually unlimited resources, and we expect they will use these tremendous resources to oppose our group and its efforts to force the state of Michigan to follow the law. We greatly appreciate your support! We are a group of citizens led by a retired Dow Chemical engineering manager, a retired senior staff of the Army Corps of Engineers, and a retired United Auto Workers attorney. All of us live near Cheboygan and are working to protect the Great Lakes and our own homes from an oil spill. Learn more at www.straitsalliance.org.